Arkansas Gov. 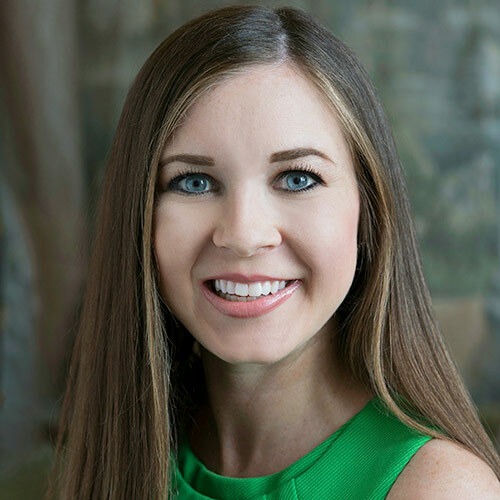 Asa Hutchinson has appointed Megan Tollett to the Henderson State University Board of Trustees. Tollett will serve until January 2026. She replaces Deborah Nolan whose term expired this year. 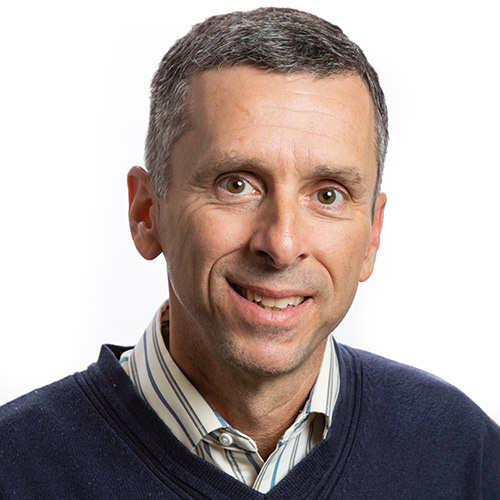 Tollett is the chief financial officer for Impact Management Group (IMG), a public affairs, government relations, and public relations firm with offices in Little Rock, Arkansas, and Baton Rouge, Louisiana. “I am honored to receive the appointment by Gov. Asa Hutchinson to the Henderson State University Board of Trustees,” Tollett said. “Receiving my education from Henderson prepared me to be a steward of public trust, and it is now a privilege to be able to serve my alma mater in this way. A native of Dierks, Tollett earned a bachelor’s degree in Business Administration from Henderson State University with an emphasis in marketing and a minor in political science in 2007. She also holds a Masters of Business Administration from Henderson. Before coming to IMG, Tollett served as the executive director of the Republican Party of Arkansas (RPA) where she was responsible for managing the day-to-day operations of the state party and its campaigns. Tollett previously served as the political director at the RPA, acting as the party liaison to the Republican legislative caucuses and assisted Republican candidates with their campaigns and mail plans during the election. Tollett resides in Bryant with her husband, Matt, and daughter Camilla. Henderson State University has received nearly $450,000 from estate gifts to establish two significant scholarship endowments for history majors. The Carrigan History Scholarship Endowment was established from a $257,000 bequest left by Jo Ann “Jody” Carrigan who earned her bachelor’s degree from Henderson in 1953. Carrigan, who passed away in September, spent much of her career in the Department of History at the University of Nebraska at Omaha. At UNO, her specializations were in US urban history and medical and public health history. She retired from UNO in 1996. Carrigan served as a volunteer adjunct professor of medical history in the medical humanities program at the University of Nebraska Medical Center and continued to work with graduate students there until the time of her death. She was an active historian with involvement in the Organization of American Historians, the Southern Historical Association and the Southern Association of Women Historians. “Dr. Carrigan reached out a couple of years ago to begin the process of establishing her scholarship endowment because she wanted to leave a legacy at her alma mater, and we were delighted to assist her,” said Jennifer Boyett, Vice President for Advancement. The Carrigan History Scholarship will provide $10,000 per year in scholarship support to high-achieving upperclassmen seeking a bachelor’s degree in history. “Dr. Carrigan became a well-renowned scholar and a true leader in her field, publishing the definitive study of yellow fever in Louisiana history and serving at times as managing editor of Louisiana, on the advisory board of Southern Studies, and as president of the Southern Association for Women Historians,” said Dr. Angela Boswell, dean of Ellis College of Arts and Sciences. “She never forgot, however, that Henderson State made all this possible for her by giving her the opportunity to earn her degree and go on to graduate. The Michael Link History Scholarship Endowment was established from a $190,000 bequest from Michael Link who earned both his bachelor’s and master’s degrees from Henderson in 1962 and 1963, respectively. He was also a lineman for the Reddies football team. Link, who passed away in April of 2016, spent more than 50 years teaching history at Arkansas Tech University where he also served as a student advisor. A master of the French, German, Latin and Bulgarian languages, Link was a member of the European Section of The Southern Historical Association. The Michael Link History Scholarship will provide $7,500 annually in scholarship support to high-achieving seniors majoring in history. Boswell said both endowments will enable many history students to finish their college degrees, enriching their lives, benefitting the state of Arkansas, and promoting the field of historical study. 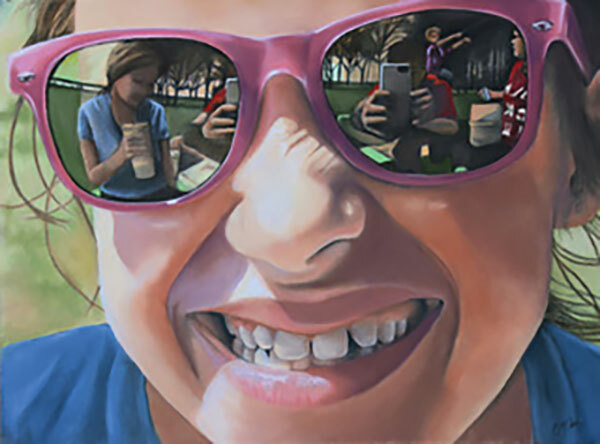 Henderson State University–Hot Springs Academic Initiatives will host its spring exhibit, Next Generation – Portraying Children and Childhood, March 1-May 31 at the Landmark Building. Artists will be present at an opening reception 5-8 p.m. March 1. The ASMSA instrumental ensembles will perform Baroque, minimalist, and jazz pieces from 5:30-7:30 pm. Teen and professional artist-created artwork will showcase each generation’s viewpoint of growing-up. The art depicts scenes of youth – playing, learning, and exploring — portraying various emotions while making sense of their world. The exhibit includes Henderson State’s 2018 Summer Intensive Teen Workshop mural, One World. Students worked with muralists Maria and Jorge Villegas to create the scene showing youth of different backgrounds in a world of vibrant nature. Adult artists include Katie Adkins, Melissa Bacon, Jan Briggs, Meikel Church, Tessa Davidson, Hugh Dunnahoe, Josh Emery, DebiLynn Fendley, Lisa Floryshak, Paige Fowler, Thomas Stanford, Sondra Strong, Marietta Tucker. Deborah Griffin, Jeri Hillis, Crystal Jennings, Connie McCann, Dennis McCann, Jason McCann, Glenda McCune, Moises Menendez, Laura Brainard Rabon, Aj Smith, Byron Taylor, Donna Twyford, Emily Wood, and Katy Wreyford. Teens from the Arkansas School for Math, Science, and the Arts, Hot Springs High School, and Lake Hamilton High School created artwork for the exhibit. The artists include ASMSA students Tracy Gwinn, Sydney Harris, Matthew Lathrop, Jackie Lindgren, Jayme Swillum, Gabriel Watson, Draper Williams, Griffin Williams, with instructors Brad Wreyford and Sara Henry. Hot Springs High School students are Rosa Amaya, Saraswati Hillis–Erickson, and Evelyn Smith, with instructor Shirley Tipton. Students from Lake Hamilton are: Stevie Hopson, Taylor Morgan, LarShea West, Alexis Greenwood, Kendra Bennett, Elaina Willey, Neil Cole, Kylie Schroeder, with instructor Rana Ward. Next Generation is located in the Landmark Building, 201 Market Street, in Hot Springs, and is open Monday–Friday, 9 a.m.– 4 p.m., and Saturday and Sunday by appointment. Call 501-545-0534, or email hsv.landmark@yahoo.com. The exhibit is sponsored by The Morris Foundation. 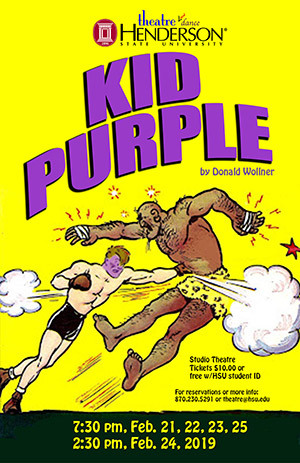 Henderson State University Theatre will present five performances of Kid Purple by Donald Wollner at 7:30 p.m. Feb. 21, 22, 23, 25, and 2:30 p.m. on February 24 in the Arkansas Hall Studio Theatre. A reception will follow the opening performance. The comedy examines some of the popular prejudices of our times. Kid Purple is the story of Benjamin Schwartz, who was born with a “slight pigmentational abnormality.” He is purple from the neck up. His is the universal story of the offbeat kid who does not fit the family or community mold and goes out to make a world for himself, searching for happiness in a non-purple world. The cast of the Kid Purple includes: Baleigh Almond of Hot Springs; Riley Brule of Dekalb, Texas; Aaron Burnside of Hot Springs; Brandon Curtis of West Memphis; Hannah Mims of Fouke; and Cecil Nicholson of Clinton. The play is under the direction of Douglas Gilpin, professor of theatre arts, with costume and makeup design by William Henshaw, professor of theatre arts, and sound design by Claudia Beach, professor of theatre arts. Joe Kalinowski of Searcy serves as scenic and lighting designer, and Aaron Burnside of Hot Springs is fight choreographer. Stage manager is Wyatt Gunter of Sheridan. The Feb. 22 performance has been designated Faculty/Staff Appreciation Night. All Henderson faculty and staff and one guest are invited to attend the performance free of charge. Advance reservations are recommended. The HSU Theatre Box Office in Arkansas Hall will be open for advance ticket sales from 1-4 p.m. beginning Monday, Feb. 18. All seats are reserved. Admission is $10, or free with an HSU student ID, courtesy of the Student Activities Board. For more information or reservations, call 870-230-5291, or e-mail theatre@hsu.edu. 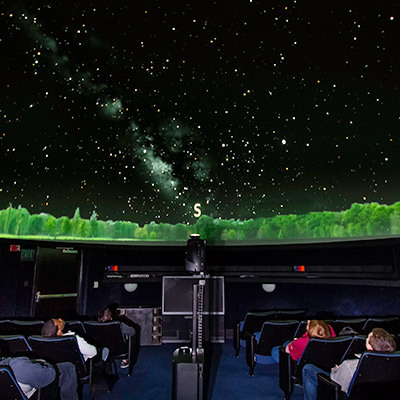 Henderson State University will celebrate the installation of its new high definition planetarium projector with special grand re-opening showings at the planetarium Feb. 16-17. The Society of Physics students and the HSU Flute Choir invite the public to explore the night sky while listening to the sounds of the flute choir. The shows are Saturday, Feb. 16, at 5:30 and 7 p.m., and Sunday, Feb. 17 at 2:30 p.m. The planetarium is located in the Reynolds Science Center. While the event is free, a donation of $5 is suggested. The proceeds will help the flute choir purchase its contrabass flute and will help Society of Physics students attend the country’s largest undergraduate physics conference later this year. The planetarium can seat 40 visitors for each show, therefore, seating will be first come, first served. The shows last about 30 minutes. For more information, contact Clardy at clardys@hsu.edu. The Arkansas Department of Higher Education has approved Henderson State University’s Educational Specialist degree in Principalship. The new degree will allow individuals who have earned a masters degree in another area in education to earn an advanced degree that will prepare them to move into a leadership role as a building level administrator in a K-12 school setting. Enrollment for this online course is available now, and designation as an Ed.S. candidate will likely begin this summer. “The Educational Leadership program at Henderson State has a distinguished history of preparing high-quality school leaders,” said Dr. Celya Taylor, dean of Teacher’s College, Henderson. “The key to program success is the personal interaction with full-time faculty — experienced leaders who provide practical guidance in an online class setting. Candidates will have the opportunity to earn a 30-hour educational specialist degree rather than completing a 24-hour building level administrator licensure program of study. For more information about Teacher’s College, Henderson, go to hsu.edu/Academics/TeachersCollege. Megan Skartvedt, a sophomore marketing, entrepreneurship, and accounting major from Russellville, was crowned Miss HSU 2019 Feb. 10. Skartvedt also won awards for talent and overall academic. Peyton Davis of Cabot was first runner-up; Haven Hughes of Bryant, second runner-up; Lexie Jeffords of Sheridan, third runner-up; and Aiyanna Bartley, fourth runner-up. 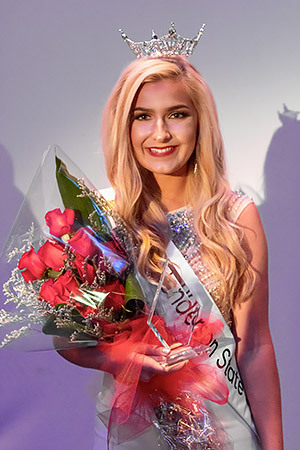 Phoebe Grace Johnson of Little Rock was crowned Miss Henderson State University Outstanding Teen 2019. Charlee Lewellyn of Jonesboro was first runner-up; Mallory Sharp of Jonesboro, second runner-up; Blaise Batson of Arkadelphia, third runner-up; Maurin Richey of Benton, fourth runner-up. Henderson State University’s nursing program has been ranked as one of the best in Arkansas by Registered Nursing.org. With 26 nursing programs in the state, Henderson’s was ranked second best. For more information about Henderson’s nursing program, go hsu.edu/nursing. Twelve Henderson State University students will vie for the title of Miss HSU 2019 at 6 p.m. February 10 in Arkansas Hall. The pageant will feature lifestyle and fitness, evening gown, and talent competitions, and is a preliminary event for the Miss Arkansas Pageant. The evening will also include the inaugural Miss HSU Outstanding Teen Pageant with eight contestants. • Aiyanna Bartley, a sophomore biology, pre-med major from Atlanta, Ga. Outstanding teen contestants are: Blaise Batson, Arkadelphia; Charlee Lewellyn, Jonesboro; Phoebe Grace Johnson, Little Rock; Brooklyn Buford, Arkadelphia; Bailey Gibson, Hot Springs; Mollie Tiner, Stuttgart; Lexie Weatherford, Little Rock; and Mallory Sharp, Jonesboro. Admission is $5 at the door, or free with valid HSU ID. Entertainment will be provided by Miss HSU 2018 Jeana Lovett, Miss HSU 2017 Olivia Moore, Miss Arkansas Claudia Raffo, Miss Arkansas Outstanding Teen Camille Cathey, Kaneil Purifoy, William Tedford, and Jennifer Wright. Ricki Rebollar, spirit coordinator for Henderson athletics and alumni relations, will serve as pageant host.